The remains of Capernaum of the New Testament are located on the northern shore of the Sea of Galilee. The town was a center of Jesus' activities in the Jewish Galilee (Matthew 4:13, 8:5) and became known as "His own city" (Matthew 9:1), where he performed several miracles (Luke 4:31-35; Matthew 8:14-17; Mark 5:21-42), and visited the synagogue (Mark 1:21-28). Capernaum is also mentioned by Josephus Flavius (Life 72), who was brought there after being wounded in battle. Christian sources of the Byzantine period describe Capernaum as a village inhabited by Jews and Christians. In the Early Muslim period (7th-8th centuries), Capernaum continued to prosper, then declined and was abandoned in the 11th century. Its ruins were known in Arabic as Tel Hum, preserving the ancient Hebrew name Kfar Nahum (the village of Nahum). The remains of the buildings and of the synagogue were identified in 1838 by Eduard Robinson as Capernaum of the New Testament period and have since then attracted many researchers, primarily Christians. The site was acquired by the Franciscan Fathers at the end of the 19th century, and they conducted excavations, mainly of the synagogue building and of the octagonal structure south of it. The synagogue was partially restored in the early 20th century. 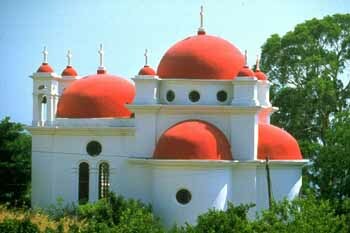 Extensive excavations in the area of the village and of the foundations of the synagogue and the octagonal structure were renewed by the Franciscan Fathers between 1968 and 1972, and in 1978-1982 excavations were conducted in the area of the Greek Orthodox church, east of the synagogue. Capernaum was first established during the Hellenistic period (2nd century BCE). During the period of Jesus' activity in the Galilee (beginning of the 1st century CE), it was a large Jewish village. In the Late Roman and Byzantine periods (3rd-7th centuries) it became a prosperous town spread over some 13 acres, along the shore of the Sea of Galilee and the moderate slope to the north. The inhabitants were fishermen, farmers and merchants. A Roman milestone bearing an inscription from the period of the Emperor Hadrian (early 2nd century CE) attests to the important road across the village, which linked the Galilee with Damascus. Excavations revealed that the houses of the Second Temple period were arranged in insulae (blocks) with streets running between them. Generally consisting of a large courtyard surrounded by rooms, the houses were constructed of local basalt and cement and their walls were covered with light-colored plaster. Each house had only one entrance, from the street. The courtyards were paved with basalt, and staircases were built along their walls, which gave access to the second story or the roof. Many ovens were uncovered in the courtyards, and the houses contained numerous grinding stones made of basalt. The synagogue of Capernaum was an impressive structure. Built of large, white limestone blocks from the hills of Galilee west of the town, it stood out among the buildings of grey basalt surrounding it. The synagogue was built on a platform, two meters above the houses of the town, and separated from it by streets on all four sides. Oriented north-south, it had a decorated, southern façade towards Jerusalem. The synagogue consisted of a prayer hall (20.5 x 18.5 m.), a courtyard to the east (20.5 x 11 m.) and an entrance porch (4 m. wide), running along the façade of the entire building. Staircases, on both sides of the entrance porch, led to the synagogue. The prayer hall was reached from the courtyard by a single entrance. All parts of the synagogue were paved with large, thick slabs of smoothed limestone. The Prayer Hall. Basilical in plan, its outer walls were decorated with prominent, flat pilasters. Three entrances in the southern wall opened from the porch to the prayer hall. The hall was divided by a row of columns (16 in all), that created three narrow aisles along three of its walls (all except the southern wall of the façade). The columns were placed on high pedestals and supported Corinthian capitals. Stone benches were placed along the western and eastern walls. The researchers cannot agree whether there was a storey above the prayer hall; according to a proposed reconstruction, the prayer hall was covered by a gabled roof constructed of wooden beams with clay rooftiles. The Courtyard. An addition on the eastern side of the prayer hall, constructed at a later date, was reached from the porch in the south by two entrances, with another entrance via a staircase in the northeastern corner of the courtyard. There were three windows in the eastern wall, high above street level. The courtyard was divided by columns into a central, unroofed part, with three covered porticos along the walls, except along the western wall (shared with the prayer hall). Synagogue decorations. The synagogue was decorated with a white limestone relief of very high quality and included a number of motifs unknown from other ancient synagogues. Hundreds of fragments of decorated masonry elements were found in a heap covering the remains of the synagogue, scattered nearby, or in secondary use. These decorations once embellished the upper part of the building, mainly its outside, but despite the abundance of decorations that survived, it could only be partially restored. The figurative motifs are few and many have been broken by iconoclasts. There were figures of animals, as in a cornice depicting a sea horse and two eagles with a wreath in their beaks. An eagle also appears in the center of the lintel above the main entrance to the prayer hall. On the lintel above the western entrance to the prayer hall appears a lion; statues of lions were apparently also placed on both sides of the gabled roof (acroteria). Jewish motifs were common: a seven-branched menorah with a ram's horn and an incense shovel appears on one capital; on a lintel is a chariot, which is widely regarded as depicting the Ark of the Covenant. Among the floral motifs with Jewish connotations are palm fronds, clusters of grapes and pomegranates. There are also geometric motifs, including rosettes, stars, pentagons and hexagons. Halfu son of Zebida, the son of Yohanan, made this column. May he be blessed. Dating the synagogue. Researchers'opinions differ regarding the date of the synagogue's construction. All agree that it is not the 1st century CE synagogue from the time of Jesus. According to most, the Galilee synagogue type, to which the Capernaum synagogue belongs, dates to the Roman period (2nd and 3rd centuries CE). It includes Roman architectural elements (the columns and the architectural elements above the columns: the architraves, the friezes and the cornices) with emphasis on the external form and decoration of the structure. Historical data also support this construction date. In this period, following the destruction of Jerusalem and the Temple, the Jewish population and its religious institutions were concentrated in the Galilee, where their political and economic predominance made the building of so elaborate a synagogue posssible. Among the structures uncovered beneath the prayer hall of the synagogue was a well-paved floor extending over a large area. The foundation of the western wall of the prayer hall was constructed of basalt, unlike the other limetone walls of the structure, and its orientation was also slightly different from the wall above it. The excavators concluded, therefore, that the stone floor and the lower-earlier western wall are remains of the synagogue from the time of Jesus described in the New Testament. Supporting this conclusion is the fact that it was common practice to build new synagogues and churches on the ruins of previous ones. The excavators' conclusion regarding so late a date for the synagogue at Capernaum is most surprising and not accepted by all researchers; it could have far-reaching archeological and historical repercussions. Is it possible that the elaborate synagogue at Capernaum (and other synagogues resembling it in the Galilee), were constructed under Byzantine Christian rule, in apparent contradiction to what is known concerning the hostile attitude of the Byzantine administration towards the Jewish population. Is it possible that the Roman architectural style remained in use for building synagogues in the Galilee alongside the characteristically modest Byzantine-style buildings? These were decorated inside only, the apse faced Jerusalem and they had colorful mosaic floors with a variety of figurative motifs and Jewish symbols. Located some 30m. south of the synagogue, structural remains of three building periods were uncovered. In the lowest level were remains of a dwelling of the 1st century BCE, identified by Christian tradition as the house of St. Peter. During this early period, religious significance was already attributed to the building, rooms were added and its walls and floors were covered with light-colored plaster. The building and its largest room (7 x 6.5 m.) served as a domus ecclesia (church house) for the community. Pilgrims who visited there in the Roman period left graffiti on its walls, including the words "Jesus", "Lord", "Messiah" and "God" in Greek, Latin and Syriac, as well as Christian symbols including the crucifix, a boat and fish. During the 4th century, the building was enclosed by a high-walled, square precinct (27 x 27 m.). An atrium was added at the entrance and its walls were covered with colored plaster. In the mid 5th century, an octagonal church was constructed on the earlier remains. It consisted of two concentric octagons (16.5 m. and 8 m. in diameter, respectively). The inner octagon was built directly on the walls of the House of Peter, so as to preserve a memory of that building. It was paved with colored mosaic and had a peacock, an ancient Christian symbol for eternal life, at the center. On three sides of the outer octagon were porticos paved in mosaic with geometric designs. The entrance to the building was on the west side. On the east side was a small apse with a baptismal font and rooms on each side. Excavations in this area east of the synagogue revealed remains of a village which existed from the Byzantine period to the 11th century. The houses were constructed of basalt and paved in stone. An apparently public building (13 x 13 m.) of the Byzantine period was modified to serve as living quarters in the early Islamic period. On the northern slope of the village, a planned residential area was exposed. It included a series of dwellings with courtyards and streets between them along which ran drainage channels. Evidence of destruction by earthquake (apparently in 749), was found there.